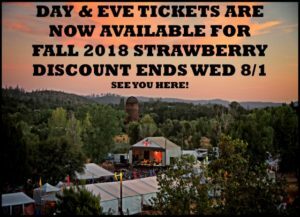 Discounted DAY and EVENING tickets (which do not include camping) are now available for the Fall 2018 Strawberry Music Festival. This discount will only be available until midnight on Wednesday, August 1st. Festival gates will open in just 42 days and we are very excited to present this year’s lineup in the newly renovated Westside Pavilion. With expansive lawn seating, enjoying Strawberry’s Main Stage performances at Westside has never been more comfortable. Camping tickets are also available. Enjoy the savings you get from planning ahead and make Strawberry your home away from home for the holiday. Click the post picture to buy your Strawberry tickets online. 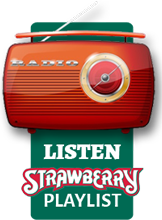 Visit our website at http://strawberrymusic.com/lineup/fall-festival-lineup/ to view the Main Stage schedule. If you have questions, or wish to order tickets from a live human being, please call our office M-F, 9-5 at (209) 984-8630.